It was, by far, the ugliest football game supposedly played by professionals all year, and I’ve watched pretty much every available preseason and regular-season football game that’s been on television this year. In more ways than one, this game was brutal, but nobody’s feeling the pain more than Chicago Bears quarterback Jay Cutler. 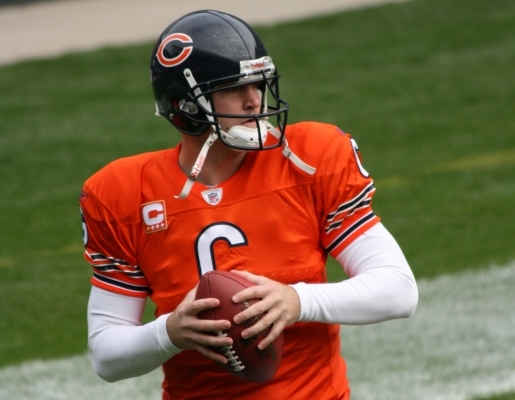 Not only was Chicago’s starting QB knocked out of the game with a concussion, Cutler was sacked for an NFL record 9 sacks in the first half during Chicago’s game with the New York Giants on Sunday Night. Chicago couldn’t block anyone last night, and it showed in the Giants’ gaudy defense numbers. They scored 10 total sacks and knocked not one, but two quarterbacks out of the game. First, Cutler went down with a concussion after getting sacked on 33 percent of his snaps played (9 times out of 27 snaps). Then veteran backup Todd Collins came into the game and eventually also left the game with an injury. The team’s third quarterback, Caleb Hanie, was the victim of the tenth sack, but by that time the game was already over. I guess times are different than when George Blanda was in the NFL, or maybe things are just different when you break a record you don’t want to break.